You will notice that this isn’t this week’s album review. Last weekend, things happened, and I didn’t get the time I needed to work on the review. I thought I would get to it now. But last night in my house, we had a medical scare. On the plus side, I can now report that all is well. But the blog gods are making it clear that I am not supposed to do a review this week. So, the review I planned for this week will appear next week instead. And, in the meantime, a trip to the doctor seemed very much to the point. Rock and Roll Doctor is a fine example of what the real Little Feat sounded like. Active throughout the 70s, Little Feat wisely broke up when Lowell George died in 1979. But then the surviving members tried to bring the band back, and there is a band called Little Feet around even now. To me, though, Little Feat must have Lowell George singing, playing slide guitar, and writing many of the songs. By the same token, when George did a solo album in 1979, it wasn’t the same either. They didn’t always get along, but Lowell George and the other members of Little Feat needed each other. I thought Lowell's solo album was pretty good actually even if there were a few fillers in there. 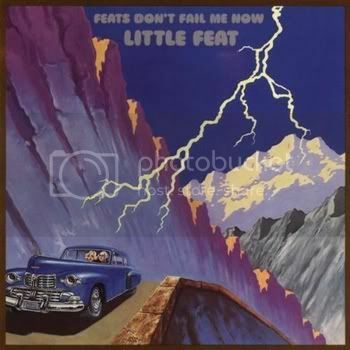 I agree that Little Feat without Lowell aren't really Little Feat at all. He was the heart and soul of the band (and the voice). I bought it first time around for 99p and then upgraded to the download version. I like all the songs you mention as well as his version of I Can't Stand The Rain and Find A River. In fact, I think the only weak song on the album is the last one, Himmler's Ring.